Buying a new house in Arizona is an exciting step. You may be buying the house with your significant other, family, group of friends or just for you, it’s still an exciting step. Plus it’s house, an estate, that you are building for yourself. Before signing your name and starting calling a house your own, you need to inspect the house for termites. Why termites, and not any other house conditions? Inspect your new house from top to bottom, in and out, and triple check in order to have an adequate, functional, pest free, and termite free house. Most new homeowners forget to inspect their new homes for unexpected pest. Termite are creepy, sneaky, tiny critters that love to live in the dark. It’s difficult to detect termites with an untrained eye, however, the following list are tricks on how to conduct a quick, simple and assured termite inspection of your own while you’re house hunting. If you spot any trials that look like pencil-sized, mud tunnels on the walls, tight corners, or in humid, dark temperature rooms, that is your first sign of possible termites. Termites make these mud tunnels out of tiny wood pieces, soil, termite feces, and debri. Finding these mud tunnels inside the house will be difficult, but outside around the foundation will be very visible. You might have to duck down to spot the tunnels on the exterior of the house. Termites wander from the outside to the inside of your house looking for a suitable habitat and delicious food. It’s less likely that you will be touring a house that has a chance of termite swarms, but you never know. In Arizona, termites are attracted to light and are typically found in light fixtures and in windowsills. Get the chance to check those during the house tour. Also, if you spot a mud tunnel that leads to a mud tree figure on the wall or bigger than a pencil, that’s a termite swarm. Since termites main food source is wood, their droppings will look like a pile of coffee grounds. Its commonly referred as “frass.” Believe or not, termites are good housekeepers. They like to keep thier tiny, cozy tunnel free from termite feces. So, they will stroll out of their tunnel home, and push droppings in your home. If you spot a pile that looks like coffee ground, but smells like mold, someone needs to call termite exterminator. Unfortunately, there are termites that can fly. If you are house hunting during the spring time and monsoon season in Arizona, better keep an eye out for discarded wings. The wings won’t look like the typical insect wings, they are clear and look like fish scales. If the house that you liked has wood, keep an eye out for buckled or warped wood. Water damages, poor insulation installment, and mold the top causes that create bumps on the wood. Termites are another possibility. However, buckling wood, warped floors, swollen ceilings and cracks in your walls and on the floors are mostly signs of water damage and termite infestation. Whatever that case is, make sure a termite exterminator in Goodyear and a plumber inspect your new home. Keep these five termite warnings whenever you are house hunting. Buying a house is exciting, but feels risky, and if it turns out that the house you bought was vacant with termites, you will have regretted the decision. Just like you keep an eye on the wiring and plumbing of the house, keep an eye out for termites. Ask questions to the real estate agent. Has the house been infested by termites or other pest? For how long was it infested? How long ago was the termite infestation? What termite treatment was used? Is there a possibility for termites in the future? How old is the house? If you are aware that the house is infested by termites, you might be able to negotiate a price with the sellers. If the sellers recently had termites, hired a Goodyear termite pest control company and solved the issue, you might of the possibility to negotiation the cost due to possible repairs or renovations that may be needed due the termite infestation. Whatever the case may be, no termites, possibility of termites, past termite activity, or prevention of future termite activity, calling a termite pest company after choosing and/or buying house is a good choice. It’s important to have a termite inspection in Goodyear because the place will become your home. Every home deserves to be will maintain and healthy. Plus, termites can lower the quality and quantity of the house, introduce mold (which can spread diseases) and may cause your house to fall apart. 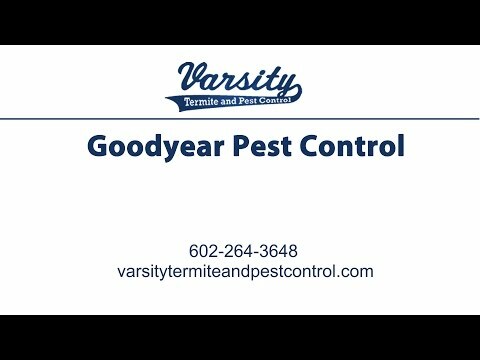 Varsity Termites and Pest Control have certified termite exterminators that will conduct a free termite inspection on your new home. If there is minor activity of termite or you just want to prevent termite infestations, we will conduct the proper termite treatment. Contact us today!